Happy New Year, Space Unicorns! 2016 was an incredible year and we’re excited to see where we’ll go in 2017. Everyone in the Space Unicorn Ranger Corps has been wonderfully supportive and your enthusiasm has meant so much to us. It’s been fantastic to see how much our readers have been enjoying Uncanny’s fiction and while we have our personal favorites, we’d like to know which stories YOU loved from Uncanny in 2016. We’ve set up a poll for Uncanny readers to vote for their top three favorite original short stories from 2016. (You can find links to all of the stories here.) The poll will be open from January 9 to January 30, after which we’ll announce the results. We will also be running polls to ask what your favorite poems, nonfiction, and cover art were in the following weeks. We’re excited for you to share which Uncanny stories, poems, nonfiction, and art made you feel! A snazzy certificate will be given to the creators whose work comes out on top of each poll! 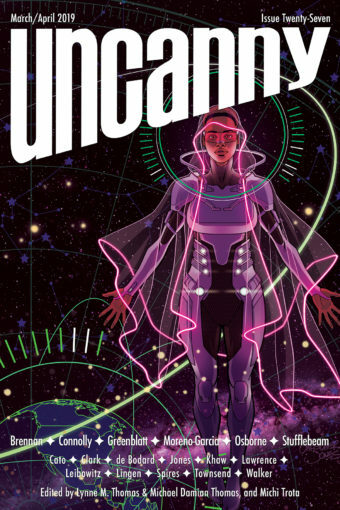 Did you know Uncanny Magazine is on Instagram? Follow us at @uncanny_magazine! We’ll be highlighting our favorite quotes from Uncanny’s short fiction from 2016. Starting on Monday, January 9, we’ll post those quotes on Instagram!